(15Jun04) This issue repeats the all important sail area math essay. The 1July issue will present the 15th Midwest Messabout if I can round up photos by then. Otherwise ???? Steve Bird has a rare Mixer2. 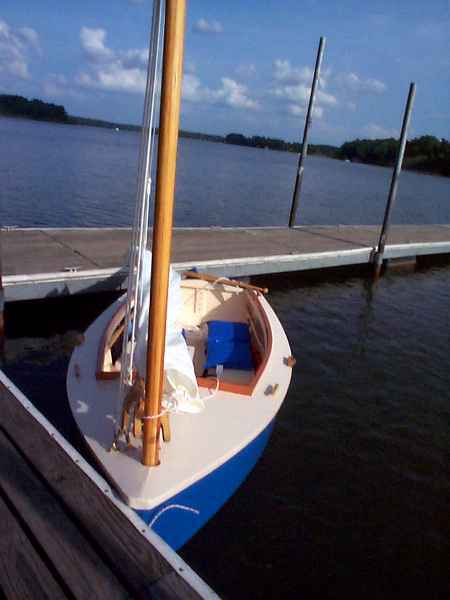 ...We'll look at the last Midwest Messabout at Rend Lake. Straight enlargements rarely work perfectly and so it was with Cormarant from Caprice. (Don't forget that Caprice was an enlargement of Frolic2, etc., etc., right on down to my Toto canoe.) In this case I narrowed it from a straight enlargement to keep the width within simple towing limits since this large boat is supposed to live on its trailer most of the time. The layout is quite similar. The idea is that the adults sleep in the center cabin and the kids sleep in the forward room. Like Caprice, Cormorant has water ballast, over 1000 pounds of it. Total floating weight with family is going to be up to 4000 pounds. You don't tow a boat this large behind a compact car but I think towing this sort of weight is common today, all done with expensive large trucks I'm afraid. 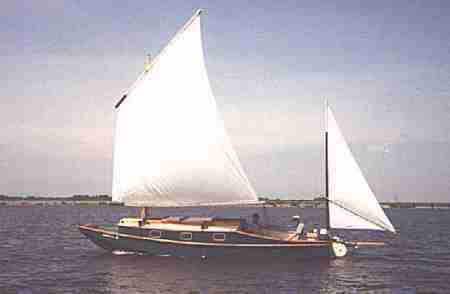 The sail rig looks pretty modest with a 207 sq foot main. I'll bet it is enought since this shape is easily driven. 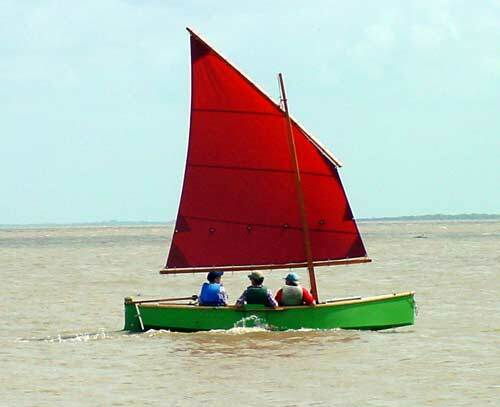 I don't think you can go any larger and still hope to handle it without extra crew and gear.Tthe lug sail shown is similar in size to Bolger sharpies and they seem to get by OK. Experience will show if it is too big/too little. The man who ordered the design has been working on it through the New York winter and has it 3D recently but still upside down. Hard to step back and admire your work on a project this large. 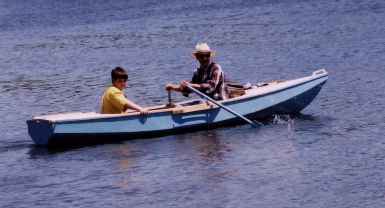 He has lots of small boat experience and is doing a great job. Constuction is taped seam, with no jigs or lofting. 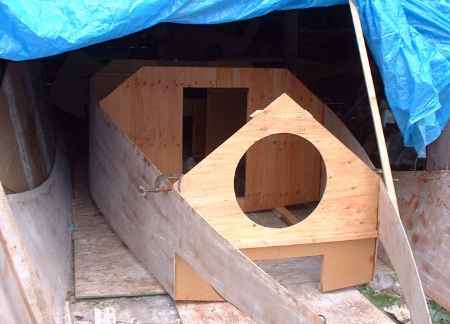 Unlike smaller designs this one does not come with a plywood panel layout drawing. Over the years I've learned two things about the ply layout page. First is that almost no one uses it. 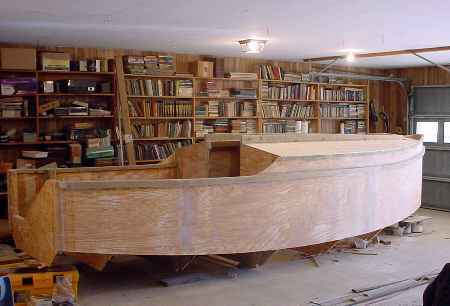 Second is that with a larger boat the work of finding and drawing and fitting all the pieces to the boat on scale plywood sheets overwhelms all the other work. 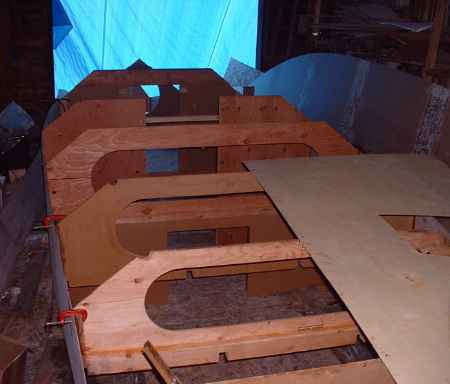 So part of the deal with doing the design was that there would be no plywood layout drawing. 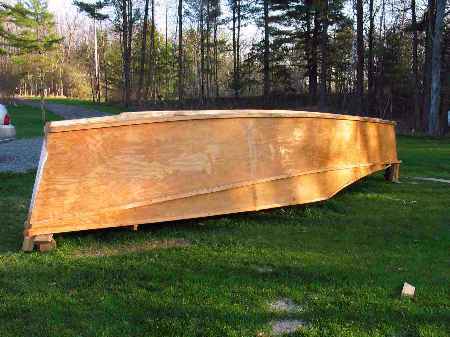 However this is still a true "instant boat" in that all of the parts that define the boat are drawn in detail and you can scale them up on plywood, cut it out and fasten together with no need for lofting or a building form. 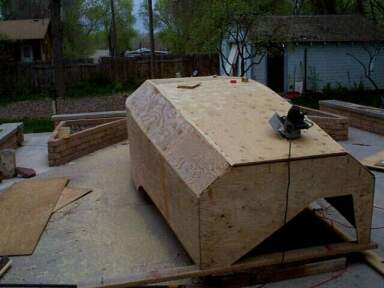 Prototype plans for Cormorant are $50 until a prototype is built and tested. Another Picara, this one with a 1' stretch in the middle, going together in Arkansas. Sailmaking done and its on to glassing the hull.